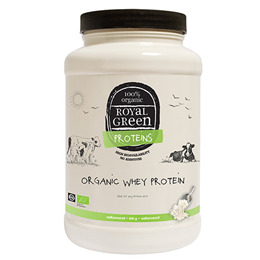 Royal Green Organic Whey Protein is 100% organic whey protein concentrate for every protein diet. This whey protein from sustainable agriculture is 100% certified organic and guaranteed free of (synthetic) sweeteners and flavours like aspartame, sucralose or acesulfame K.
Create your own natural flavour by adding delicious fresh fruit when preparing your shake. Dissolve 25g (3 tablespoons) in 250ml fruit juice, milk, yogurt or water. Food proteins should not be a replacement for a varied and balanced diet, and a healthy life style. Consult an expert before use in case of pregnancy, lactation, illness or medicine usage. Below are reviews of Royal Green Organic Whey Protein - 600g by bodykind customers. If you have tried this product we'd love to hear what you think so please leave a review. Royal Green Organic Whey Protein is 100% organic whey protein concentrate for every protein diet. This whey protein from sustainable agriculture is 100% certified organic and guaranteed free of (synthetic) sweeteners and flavours.